100% pure wool scatter cushion, crafted using the ancient art of hand felting. These beautiful bespoke cushions were lovingly made in South Africa as part of a collaboration between Krafthaus and AuraDecor Designs. Each cushion is manufactured in South Africa using soft 20.5 micron merino wool and hand dyed with environmentally safe dye imported from Germany. The warm colour palette of dark charcoal, rich cream, golden mustard and blue-green teal will complement most colour schemes. What is special about the 100% pure wool scatter cushion? 100% natural, 100% renewable, 100% sustainable and 100% biodegradable, wool is an exellent choice for interior home decor products. It is warm yet cool and well known for it's softness and luxurious finish. A great way to add layers of interest and texture to your interior decor scheme. This bespoke ethically made home textile range forms part of our Uniquely African range. Our company has South African roots and we travel frequently to South Africa. We meet with designers to exclusively source top quality South African home decor products. Most noteworthy, these unique and bespoke African decorations will give your home an original feel with 100% authentic African sourced designs. 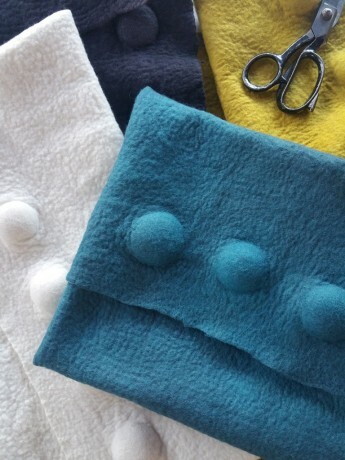 Each premium quality cushion cover is made using the ancient art of felting. The wet felting technique is a process used to create a dense non woven fabric by matting, condensing and pressing fibres together to create a flat piece of fabric. The quantity of layers of combed or carded wool determines the thickness of the product. Each bespoke luxury felt cushion cover is 20.5 - 24.5 micron. As this is a hand crafted product slight variations in size and thickness may occur. 1. Dry clean or gently cold wash only. 2. Use a gentle soap. 3. Dry in shade (sunlight will face dark colours). 4. A front end loader washing machine may be used with a small amount of gentle soap on the wool cycle (no hotter than 30 degrees). Inners of scatter cushions are not included. A dust proof percale cotton cover filled with goose feather down cushion pad is recommended.